Ron founded Ronald G. Pray Company as a young entrepreneur in 1974 establishing it in Gilroy, California. As a Registered Investment Advisor, Ronald G. Pray Company is dedicated to achieving the financial goals of all of our clients. 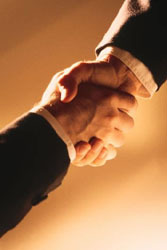 We endeavor to develop relationships built on trust and confidence that can be depended on by our clients. Utilizing our qualifications in helping you assess your financial goals, manage your capital and build a stong financial foundation that contributes to your security and well-being is our objective. Ronald G. Pray Company is a full-service financial company committed to helping and supporting our clients in their pusuit of financial success. We offer a wide range of financial products & services to individuals and business owners in order to lend to the achievement of that feat. We believe in serving you with high-quality financial information that will enable you to identify your goals and make educated decisions. It is our committment to support our clients generously. We believe long term relationships are earned and we provide continued monitoring and counseling for our clients on an ongoing basis. Visiting our qualifications, services and mission statement website pages will give you further information about us. We invite and encourage you to call us directly with any questions about our company, the financial products and services we provide and to schedule a meeting, which are always of no charge to you. Ron offers a free consultation and analysis of your financial situation with absolutely no obligation to you to pursue a continued relationship with us. He continues to enjoy working and residing in Gilroy where he founded Ronald G. Pray Company, developed his career, raised a thriving family and has grown longtime friendships. He looks forward to many more years of serving his clients and community. Since 1974 Ronald G. Pray Company has developed an abundance of relationships with a variety of financial service companies, so if we don't have a product or service, or aren't the right fit for you we will help you find a group that does.